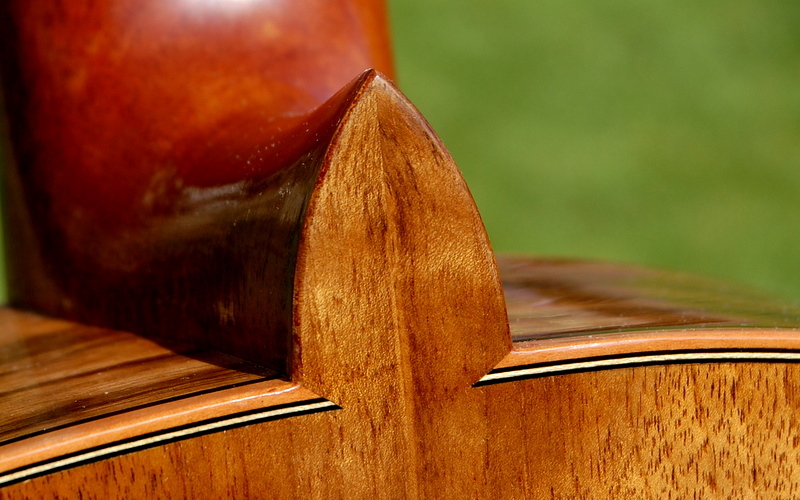 A couple of posts ago, I wrote about making a pair of tailpieces for two violinists who wanted to change the way their instruments were set up. The violinists, Pamela Rosenfeld and Liz Gregg, are members of the recently formed Tartini Trio who specialise in music of the baroque period. Naturally, they’re keen to produce an authentic baroque sound and, having already switched to gut strings and baroque bows, wanted to take things a stage further by fitting baroque bridges and tailpieces. Over the Easter holiday, Pamela and Liz visited me and let me hear the sound they were making. Very generously, and without rehearsal, they let me record them as a duet playing the Bourée from Handel’s Water Music. The primitive recording (made in my workshop with nothing more than an Edirol digital recorder propped up on the work bench) doesn’t do them justice – but even so, it sounds pretty good. 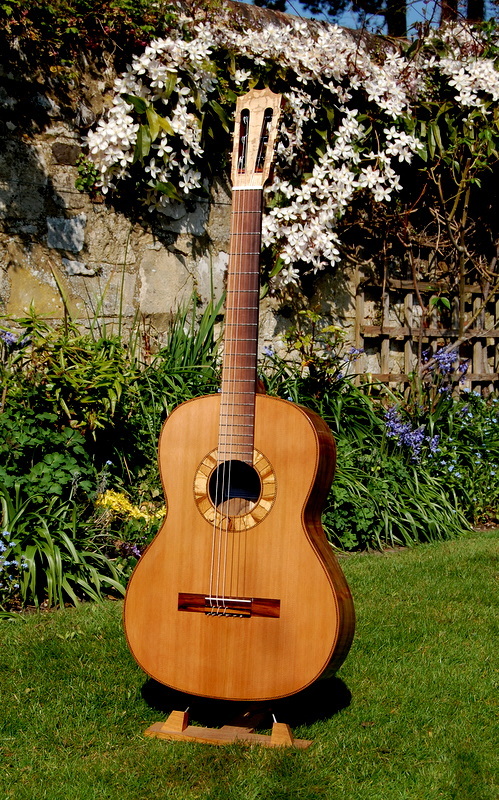 A few weeks ago, I mentioned that I had started making a classical guitar with slightly smaller dimensions than usual. I hadn’t got anything radical or particularly innovative in mind but I hoped that, by reducing the diameter of the lower bout, decreasing the depth of the ribs and using a scale length of 640mm, the instrument would be easier and more comfortable for a smaller person to play. 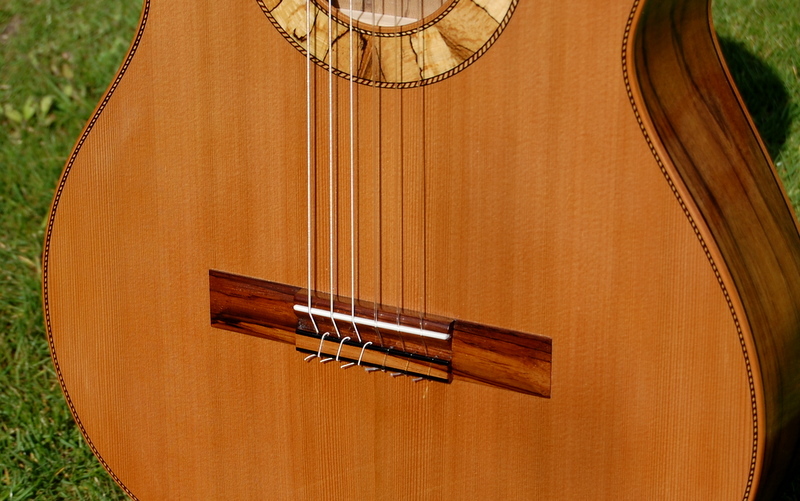 The fingerboard and string spacing were also to be narrower by a few millimeters to suit someone with small hands, and the guitar was to be as light as reasonably possible. 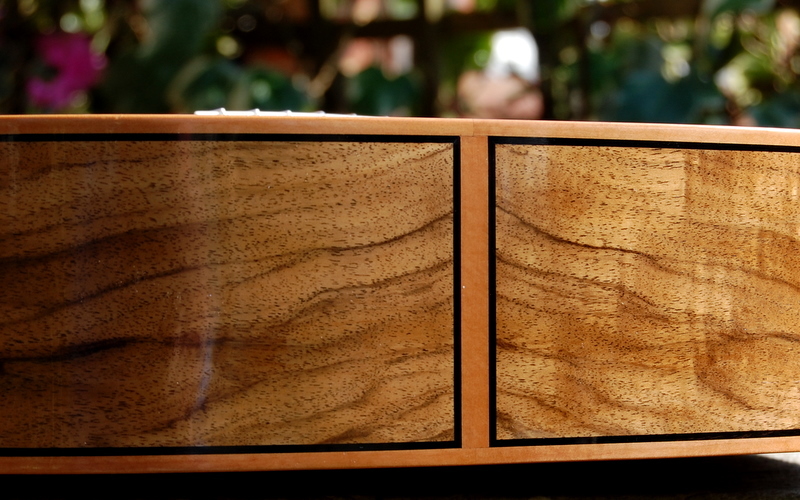 The instrument is now finished. The top is cedar with lattice bracing. 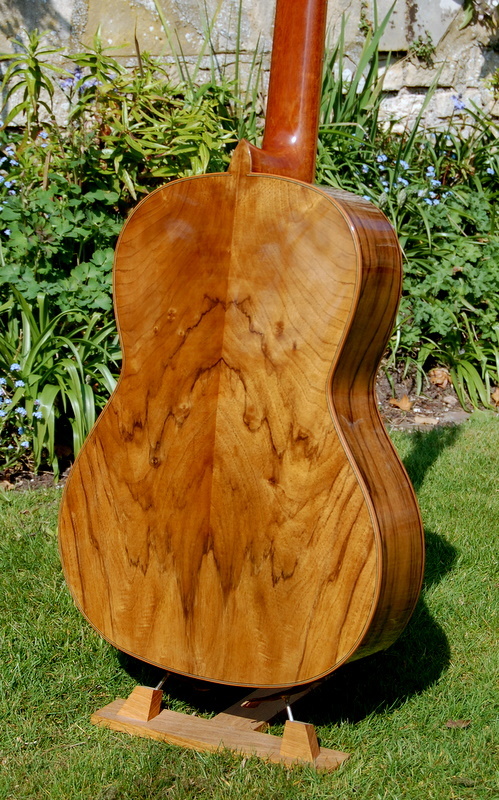 The ribs and back are of English walnut with an unusual ‘watermark’ figure and the rosette and headstock were made using spalted beech that Mark Bennett, who runs a funiture making business called the Woodlark, sold me a while ago. 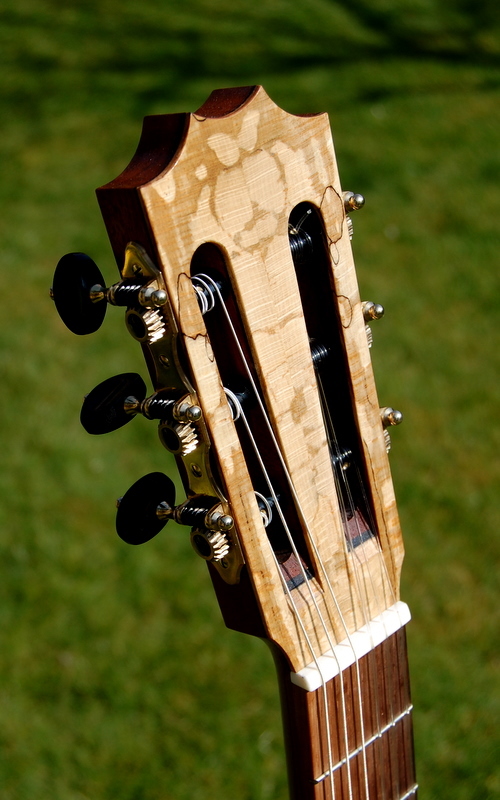 The fingerboard and bridge are of Rio rosewood and the tuning machines were made by Keith Robson. The final weight, with strings and tuning machines in place, was just over 1400 grammes, which is significantly lighter than the weight of most of my instruments. It has only been strung up for a day or two and it has yet to be played by a proper guitarist but my first impressions of the sound are good and the volume doesn’t seem to be perceptibly less than that of larger instruments. 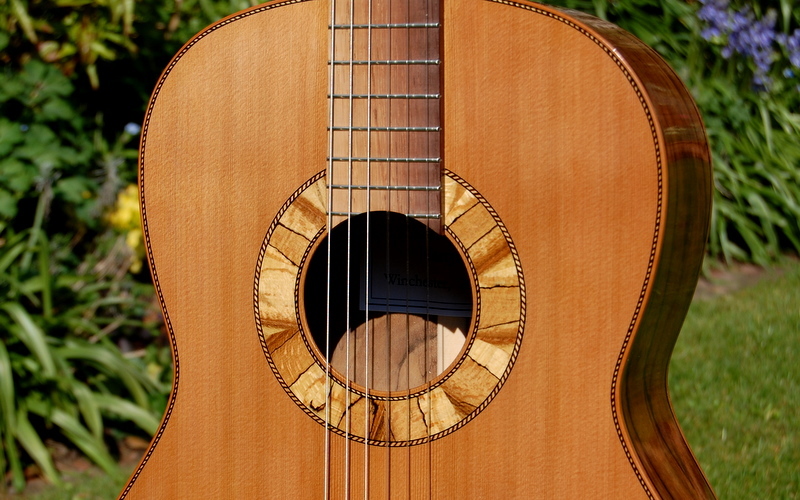 I’ll try to add a recording sometime but, in the meantime, here are a few photographs of the completed guitar.